As the son of a WWII, Korean War & Vietnam vet and a brother to a Desert Shield vet, each day that goes by while this war drudges on I feel I can't get any angrier than I already am at the human waste and destroyed lives left behind from a conflict based on a mountain of lies and desception so high it is beginning to blot out the sun and the heavens. 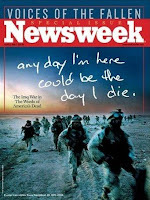 Then I read this from Newsweek's cover story "Voices of the Fallen:"
"April 2, 2007 Issue - He was exhausted, but he wanted to talk to his daughter, and the only way to do that in Fallujah was to write a letter. "This war is not like the big war—there are no big sweeping maneuvers with hundreds of tanks pouring over the border and so forth," Army Maj. Michael Mundell told his 17-year-old, Erica (nicknamed "Eddie"), on Friday, Oct. 27, 2006. "It's a fight of 10 man squads in the dark, of ambushes and snipers and IEDs. When I go out to fight, it's usually with less than 20 men ... And I go out to fight almost every day." The pace, he admitted, was punishing. "We are weary, Eddie, so very weary. I can't tell you how bone tired I am. There are times when we get back in and ... it is all I can do to drag myself from the truck and stagger up here to take off all the junk I gotta wear ... " His tone briefly brightened as he thought of Erica's life back home, where she was a senior at Meade County High School in Brandenburg, Ky.: "Tell all of your friends and your teachers that I said hello from Fallujah. I am doing well and our battalion is considered the best in the brigade. We are fighting the enemy and hopefully winning, though that is difficult to measure." He signed off with a pledge: "Never forget that your daddy loves you more than anything and that I will be home soon." Mundell could not keep that last promise. At a quarter to 2 on the afternoon of Friday, Jan. 5, 2007, he was killed by an IED while on patrol in Fallujah; the casket was closed at his funeral in Kentucky." The pain evoked in this letter is so viseral I could hardly get through it. Then you read of his death. I already suffer from high blood pressure. Perhaps I'll be a casualty as well if I don't find someway to channel my anger into some kind of action to help in my own small way to put a stop to this maddness. In 1922 when the British left Iraq with their hands thrown up in the air over the futility of it all, they should have taken those lessons and implemented them before joining in with a six gun totting Texan to overthrow what was essentially a neighborhood bully. Though we might say we don't know Maj. Michael Mundell's family, in a real sense we do. We know them all to well. His family in reality is all of us. Anyone who reads the excerpt of this letter to his daughter realizes it's much more than that. It is a letter to a nation.A nation that has not been asked to sacrifice. A nation that has sent a volunteer army into the breech without asking those left behind to contribute nothing more than bumper stickers with yellow ribbons. Yet we are told it is an epic struggle of biblical proportions where the very foundations of our civilization are at stake. Then amazingly, we are told to go shopping with stickers affixed to the rear of our cars proclaiming "Support our troops" as we head out for our next recreational endeavor. My sense of American pride and exceptionalism aches. The bluster and swaggering rattle of sabres we continue to use for foreign policy is starting to have adverse affects here at home as evidenced by the continuing fragmentation of the electorate. I'm almost sickened over the fact that we as a nation have allowed this callousness to permeate our entire government discourse. Maj. Mundell, along with all the other brave souls who rushed over to do Bush's bidding did so out of a profound sense of honor and duty. I just wish the government that sent them over there would return that same sense of honor and duty to them. That honor has surely been lost in the halls of VA hospitals like Walter Reed and others across the country. That sense of duty to these brave, wonderful souls is left in shredded promises of support through proper material to keep them protected. I'm still wondering why we didn't put this effort in Afghanistan where the real perpatrators of the 9/11 crime lay in hiding and smirking while the Texas Ranger went on a wild goose chase to Baghdad leaving a trail of fear for the voters back home to feast on. I'm still wondering why our elected leaders haven't come to the realization that our mission lies elsewhere, not the broken land we invaded and made even more unfixable by cultural mindsets that are not only unable but unwilling to merge into a common understanding. Only Iraqis can fix themselves. Not us. What I want and long for is Osama Bin Laden's hide. I want him and his henchment to be served with a justice system that has served us so well for the past 200+ plus years. Not a shrill convulsion of kangaroo courts with watered down civil liberties and color coded warnings telling us how afraid to be. Will that end the threat of terrorism? No. Will it show them there is a price to pay. Yes. Right now they are getting a free ride. I want it to end so those souls we lost on 9/11 and the dead in Iraq both civilian and military can rest easier. Some how that Texas swagger has managed to miss all that. To paraphrase a Shakespearan metaphor, Neptune's great oceans aren't capable of washing the blood from Bush's hands. His legacy is the blood stain it leaves behind. I am a combat veteran, Marine rifle company Korea 1950-51, and I think you have described powerfully the sins and shortcomings of Bush and his disastrous administration.